Will LeBron James lead the Los Angeles Lakers to a big turnaround in Year 1? Or will King James and his new teammates be mired in drama all season? According to our Summer Forecast results, there's a strong possibility of both outcomes this season. We asked the ESPN Forecast panel to rank its top three choices for 2018-19's Team Turnaround, and the franchise poised to make the biggest jump this season. We also asked our panel to rank its top three choices for 2018-19's Team Turmoil, the franchise most poised to sabotage its chances through off-the-court stumbles. There's no question as to why this team is expected to see considerable improvement, as LeBron James' greatness is self-explanatory. While analysts haven't exactly been wowed by the team's other free-agency acquisitions -- none of whom is known for being particularly strong from the perimeter -- it's fair to think the Lakers' youngsters will progress in meaningful ways this season. Getting a healthy Mike Conley back would be an enormous boon on its own for Memphis, a team that spiraled badly without him and a fully engaged Marc Gasol. But the club also snagged the best defender in the draft, forward Jaren Jackson Jr., and built a more versatile roster by signing point forward Kyle Anderson, a plus-minus savant. The Grizzlies then traded for Sacramento's Garrett Temple, a solid defender who is accurate from deep. DeAndre Jordan and the Mavs buried the hatchet and hashed out a deal for him to finally join Dallas. Yet the Mavs player most worth watching this season is clearly Luka Doncic, the prospect many analysts believe was the best in the draft. After a season in which Milwaukee had to deal with almost-constant change -- bringing in Eric Bledsoe via trade, firing Jason Kidd and welcoming Jabari Parker back from injury -- the Bucks are expecting more stability this year. Also receiving votes: Denver Nuggets (14 points), Phoenix Suns (12), Brooklyn Nets (6), San Antonio Spurs (6), Boston Celtics (3), Chicago Bulls (3), Utah Jazz (3), New York Knicks (2), Detroit Pistons (1), New Orleans Pelicans (1), Orlando Magic (1). James' presence alone increases the potential for drama in Los Angeles. That's the reality that comes with employing the top player on the planet. But the Lakers also added Lance Stephenson, Rajon Rondo, JaVale McGee and Michael Beasley -- all players with strong personalities who are on one-year deals and eyeing free agency again in 2019. There was plenty of sniping in the Wizards' locker room last season, particularly between John Wall and the recently traded Marcin Gortat. After Washington's first-round loss to Toronto, the Wizards' front office went out and acquired someone who brings the potential for more drama: Dwight Howard, who is on his fourth team in nearly three years. On the surface, Minnesota seems to be in a great place. The club snapped a 14-season playoff drought last spring and brings back a roster brimming with young talent. But a look under the hood shows that the team's two top players (Karl-Anthony Towns and Jimmy Butler) are dealing with contract uncertainty and the third, Andrew Wiggins, isn't playing up to the level of his $146 million deal. Houston coach Mike D'Antoni admitted last season that he resigned as head coach of the Knicks because of an ultimatum from Carmelo Anthony. With Anthony now on the verge of signing in Houston, it's easy to see why the Rockets landed on this list. How D'Antoni and Anthony coexist in this second act -- with Anthony essentially replacing a strong defender in Trevor Ariza -- will be one of the more intriguing storylines in the Western Conference. 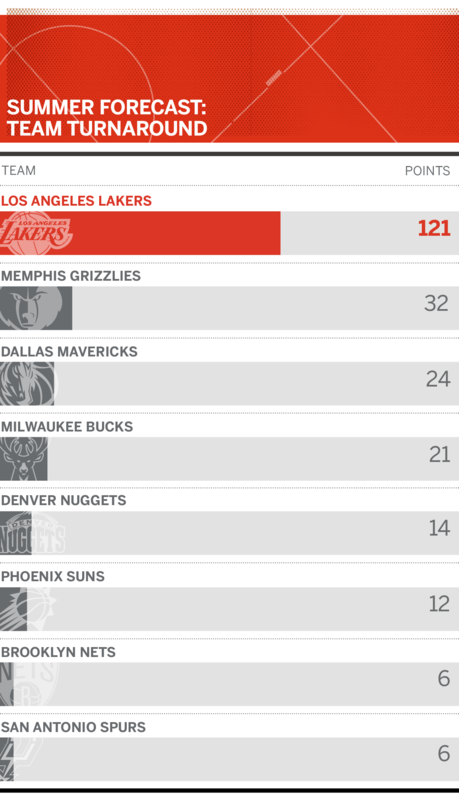 Also receiving votes: LA Clippers (8 points), Portland Trail Blazers (8), Sacramento Kings (8), Toronto Raptors (7), Cleveland Cavaliers (6), San Antonio Spurs (4), Detroit Pistons (3), New York Knicks (3),Phoenix Suns (3), Chicago Bulls (1), Golden State Warriors (1), New Orleans Pelicans (1), Orlando Magic (1), Philadelphia 76ers (1).